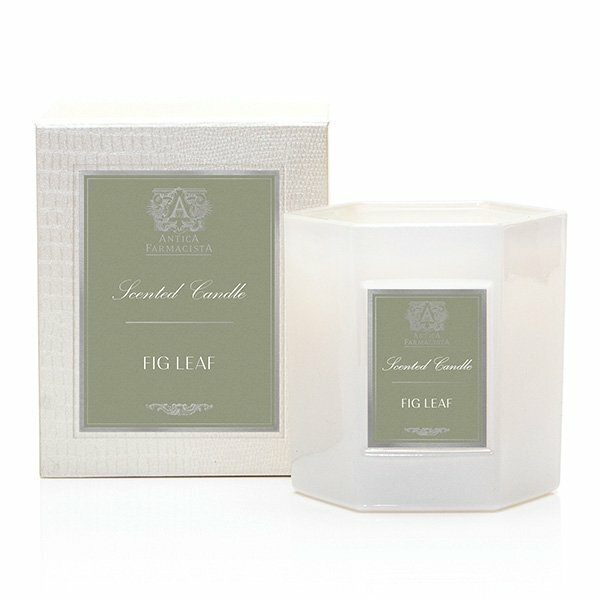 Antica Farmacista Fig Leaf Candle is a fresh, green twist on their original scent, Green Fig, evoking a summer stroll through a sun-drenched grove of ripe fig trees. Earthy notes of tomato vine and herbal hints of basil enhance the green notes of the fig leaf and stem. Luscious sweet fig complements the floral notes of soft violet, cyclamen petals and Meyer lemon blossom, while a powdery drydown composed of cedar, sandalwood and amber make this new scent complex and alluring. The signature soft white glass, now hexagonal in shape, is filled with a soy-paraffin wax blend, resulting in 60 hours of beautifully scented illumination. Packaged in a luxe hinged box, embellished with a pearlescent croc texture. Each decorative box includes a set of Antica's signature matches.